We all wish to be seen as important. We all long to be respected, acknowledged, honored, appreciated. No matter how extro-/introverted our personality, we all want glory. We long for distinction and admiration. We desire (more than anything) to be loved... to know love intimately... and to give love whole-heartedly to someone else we see as special. Yet, so many of us seek said glory outside of humility. We perform in order to be measured. We show off our talents, our bankroll, our belongings, our work efforts hoping that our "uniqueness" might be noticed and accepted by the audience of social hoopla... by the vote of popularity... by the so-called evaluators and determiners of this earth's fame, fortune, power, success. But what if there was no one to impress? What if there was no platform or publicity in which the best version of ourselves could be reviewed and rated? To whom would we be considered valuable? And, most important, how would we know love? I'm embarrassed to admit that recently our television was on merely as background noise. Seriously, nobody in my home was even watching it. It was just ON... polluting the silence... bombarding our senses... marketing, selling, pushing, influencing. Sigh. As you have probably figured out, I'm not a big fan of the television, although they seem to have multiplied in my home. These days, there are very few shows broadcasted that keep my conscience clean and/or refrain from scaring me into living life as a recluse. But that's another topic for another day. Anyway, the tv was on, and one of those "American Idol/So You Think You Can Dance/Whoever Has Talent/Simon Says Do The Hokey-Pokey" shows was airing, and I found myself getting reeled into watching. Only problem was, every person looked and sounded the same to me. Every person acted the same. Every person longed for the same accolades. Sure, some would try to identify themselves as "unique" and "more worthy" of the show's reward because, oh I don't know, perhaps they wore a cowboy hat, or they had a pierced nose ring and purple hair, or they overcame a statistically deadly disease, or they grew up too poor, too rich, too fat, too thin, too gay, too straight, too disabled, too different, too whatever. Yep, every person seemed to be so boringly the same in their quest for uniqueness, importance, glory that all I could think of was "there is nothing new under the sun." It saddens me to consider how many are stuck settling for less of God's presence in their life because they are too busy pursuing more of themselves. How easily we run our hardest and fastest - only in the wrong direction. How often we struggle to have what we want rather than want what we have already been given, mind you, for free! What if we humbly gave our best each day, and then let the glory go? For if we did that, how would our life prove valuable? And, most important, how would we know and receive love? 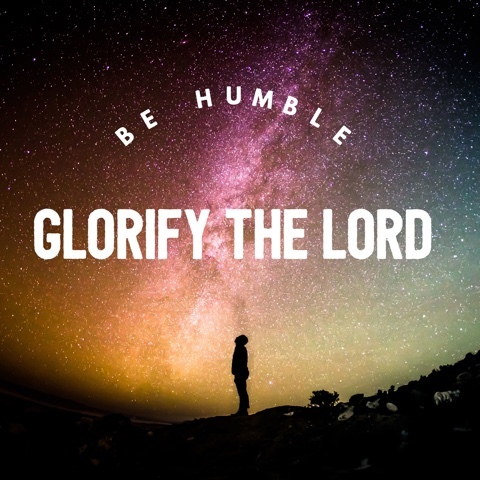 The truth is this: the only glory that is worthwhile, lasting, and promised to benefit us in full is the glory that comes from our willing humility redirected toward the Creator that already says we are most cherished, most valuable, most important, most loved. He is all we need. His is the only approval and reward that matters. You see, we were not created to receive glory, but rather to give it. We were not made to seek after our own gain, but rather to love with our whole heart, mind, soul, and strength. Leaving all praise and reward at the trustworthy throne of the one true God. The God who loves. The God who gives. The God who provides. The God who is everything! Without His magnificence, this life is indeed vanity, meaningless. Without His love, we are all boringly and obviously dead. Won't you praise Him today? Won't you humbly forgo the rest and love Him with all your heart, soul, mind, strength?